This weekend on the back of the New York Times Review, James Patterson took out an ad on the back that asked about the future of books. 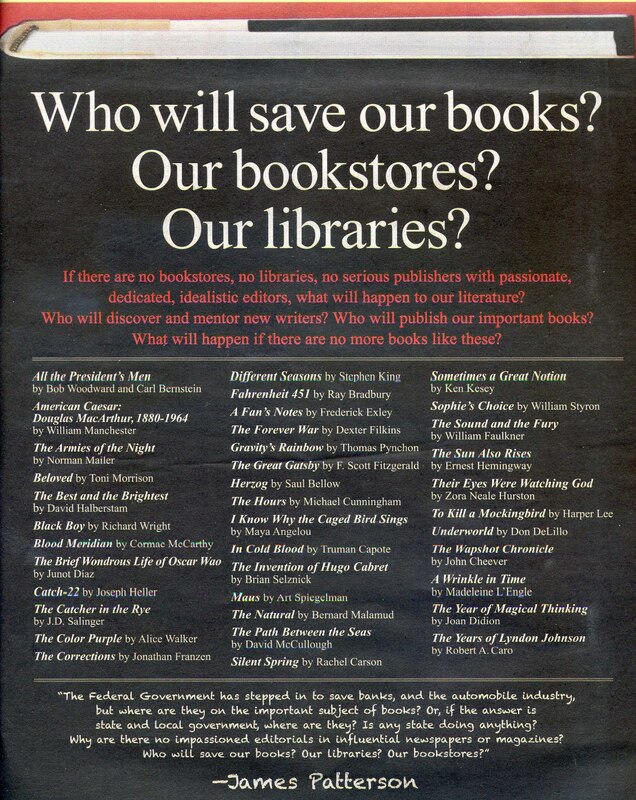 “Who will save our books? Our bookstores? Our libraries? If there are no bookstores, no libraries, no serious publishers with passionate, dedicated, idealistic editors, what will happen to our literature? Who will discover and mentor new writers? Who will publish our important books? What will happen if there are no more books like these? Following list included 37 books considered classics in different genres and with a mix of diverse authors. The picture I found of the ad came from the Facebook page of Jersey City Free Books whose webpage can be found at http://www.jerseycityfreebooks.com/. I thank them for sharing it so others can see it. I want to take some time to think about the ad, but would love to hear thoughts and reactions to it. Update: Patterson did create the ad, and talks about why in a current Salon.com article here. He wants to save bookstores, and that’s a noble cause. But he wants to do it by shutting the gates on anyone who’s not publishing books the same way he is. The thing is that he was one of the first ones to start rattling the cage loudly. Now, there’s been like 2-3 other pretty influential authors who are finding ways to rattle their cages as well against anything that’s non-traditional publishing. Time will tell who’s standing in the end. It would be great if a compromise could be had so everyone still had legs!